I met my friend Eryn our freshman year of high school when her family moved from California to Tennessee and she showed up at band camp. We became fast friends and have remained close for more than 20 years through college, multiple moves, and more. I was on a quilt retreat last October when Eryn, who now lives in Texas, texted me to say she and her husband were expecting twins! I was more than a little surprised by the news (not one baby, but two!) and so happy for them, and my mind went straight to "I have to make quilts for the babies!" I sent Eryn to a couple of online fabric shops to pick some fabrics she liked and give me an idea of her preferred color palettes. 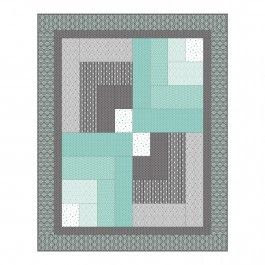 I also created a Pinterest board full of quilt patterns to share with her, again to get a feel for what she liked. She ended up picking fabrics that fell into two distinct palettes -- navy/aqua/cream and bright primary colors -- which was perfect for two distinct quilts. Eryn wanted the babies to each have their own quilt with its own look. They'll be twins forever, always paired, so a little individuality is nice. The patterns that Eryn chose are Succulent Garden by Crimson Tate and Quilt Bars, a free pattern from Camelot Fabrics. That candy-colored circle print in the top row reminded Eryn of some bed sheets she used to sleep on at her grandmother's house when she was a kid, so I knew I had to use it as the basis for one quilt. That one ended up being the Succulent Garden pattern for baby boy Ryker. The aqua and navy prints became the Quilt Bars pattern for baby girl Sophie. 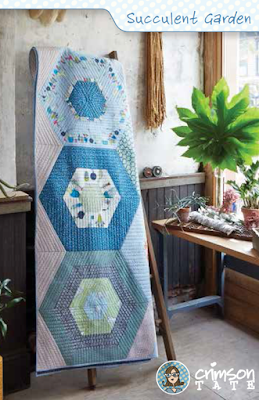 The Succulent Garden pattern, with its oversized hexagons, comes together really quickly thanks to the strip-piecing method. I cut my own triangle template for the wedges. My friend Jennifer got an AMAZING longarm quilting machine while I was making these quilt tops, and she agreed to quilt both quilts on it for me. We stood there and watched it go -- it was magical. And the quilting turned out perfect. One of the fun things about this pattern is that you're left with wedges that make a secondary scrappy hexagon. I wanted to use as much of the fabric up as possible, so I put the scrappy hexagon on the back and then filled in around it. The Quilt Bars pattern also comes together really quickly. I think my biggest challenge with this quilt was figuring out which fabrics to use and where. With my fabrics, I couldn't get the same gradient effect as the original pattern, so I decided to go with dark vs. light, with the creamy pug print at the center and corners. After a lot of back and forth -- and a lot of photos texted to my mom for her opinion -- I'm happy with the final fabrics and placement. This is honestly the fastest baby quilt I've ever made -- I highly recommend the pattern, and I'm confident I'll be using it again. For the back of this quilt, I used the creamy pug print by designer Bari J for Art Gallery Fabrics. Eryn has a beloved pug named Auggie, so this fabric was a no-brainer. I actually saw it and planned to use it as a surprise before Eryn found it and added it to her "love these" fabric list. And of course a show-and-tell of these quilts wouldn't be complete without photos of them with their new owners, Ryker and Sophie. I packed up the quilts and headed to Dallas earlier this summer to deliver them in person and snuggle the babes, who were just 2 months old. I can't wait to see them grow up with these quilts.